Why why why why why why do you say goodbye? 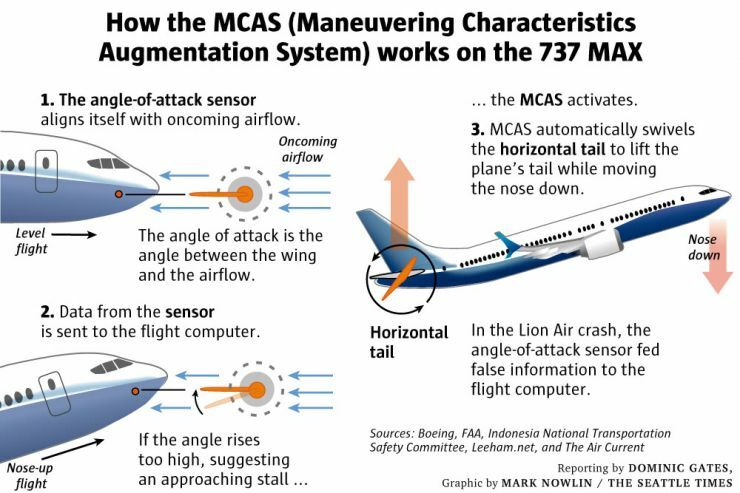 The Maneuvering Characteristics Augmentation System (MCAS) was developed for the 737 MAX to prevent stalls in flaps-retracted, low-speed, nose-up flight.. The MCAS uses airspeed and other sensor data to compute when a dangerous condition has developed and then trims the aircraft nose down. Boeing 737 MAX aircraft have engines mounted higher and further forward than previous 737 models. According to The Air Current, "the relocated engines and the refined nacelle shape" cause an upward pitching moment. In order to pass Part 25 certification requirements, Boeing employed the MCAS to automatically apply nose-down trim when the aircraft is in steep turns or in low-speed, flaps-retracted flight. When the angle of attack exceeds a limit that depends on airspeed and altitude, the system activates without notice to the pilot. The system is deactivated when a pilot trims the aircraft using a switch on the yoke. The system is sensitive to failure of angle-of-attack (AOA) sensors mounted outside the aircraft. The FAA and Boeing made the AOA Disagree alert an optional feature for the 737 MAX, deciding it was not critical for safe operation. Following the crash of Lion Air Flight 610 soon after takeoff, Boeing introduced a software upgrade that notifies pilots of a sensor failure. It will be deployed to aircraft operators "in the coming weeks," the company said on March 11, 2019. USA TODAY: Investigators believe Boeing anti-stall system was activated in Ethiopian crash: Report.